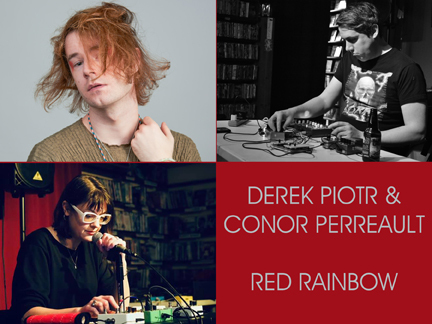 Derek Piotr, Connor Perreault, and Red Rainbow play Best Video Performance Space on Wednesday, May 1. 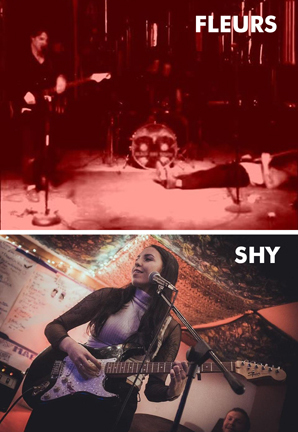 The show starts at 8 PM and the cover is a sliding scale of $5-10 (pay what you can in that range). For this show, Perreault will play solo for about 20 minutes. Piotr will join him for joint improvisation for 20 minutes and Piotr will then take solo flight for 20 minutes. Derek Piotr (b. 1991) is a Poland-born producer and composer based in New England, whose work focuses primarily on the voice. His work covers genres as diverse as glitch, left-field pop, chamber, dance, and drone; and he has collaborated with artists including Richard Chartier, Don’t DJ, and Thomas Brinkmann across various disciplines. He has been intern to Meredith Monk, had his work nominated by the jury for Prix Ars Electronica (2012), and featured on Resonance FM and BBC. Conor Perreault is a New Haven based father of two. He is a dabbler, a tinkerer, and an experimenter in sound, using whatever and whomever happens to be around to make sounds that he hopes are fun and/or interesting to hear. It usually comes out as a psychedelic firecracker freak folk smooth noise sort of vibe; pretty scary, or scary pretty. He is an active member in a clutch of collaborative projects, including but not limited to: Human Flourshing (with Greg Paul), Gora (with Sam Moth), and Big & Ready (with Michael Larocca). 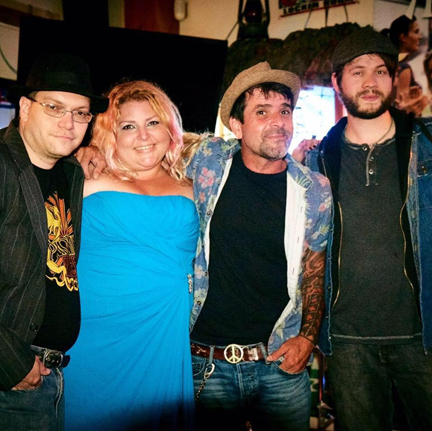 Red Rainbow is the solo project of New Haven-based vocalist Anne Anne Rhodes. She incorporates voice and electronics in conjunction with embroidered graphic scores, looping sounds as diverse as extended techniques and bel canto vocalises to create layer up layer of dissonance, harmony, and noise. 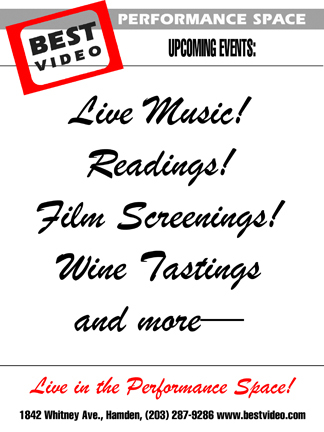 Best Video Film & Cultural Center presents “Reel Life,” a monthly stand-up comedy show that debuted in October, on Monday, Apr. 29, at 8 PM. 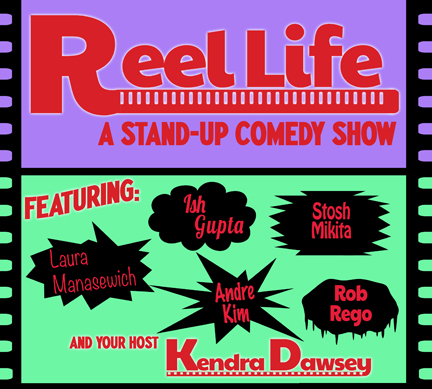 Reel Life is hosted by Kendra Dawsey, a comic who also hosts a weekly open mic at Lyric Hall in Westville and has also performed at Best Video’s Second Wednesday Open Mic among other venues throughout New England. Cover is a sliding scale of $5-10—pay what you can within that range. Also on the bill for Apr. 29 are comics Laura Manasewich, Ish Gupta, Stosh Mikita, Rob Rego, and Andre Kim. Note: Comic routines may feature explicit material and language. 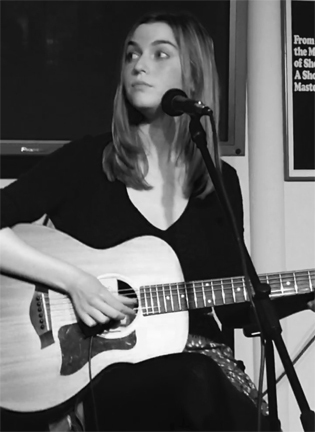 Laura Manasewich is a comic from Hartford, CT. She performs regularly throughout the Northeast and beyond. She’s hosted for Emma Willmann at the Vermont Comedy Club, featured at Shaskeen Comedy in Manchester, NH and was a participant in the 2018 She Devil Comedy Festival in NYC. Laura looks for the relatable in life. Salty with a smile, you can watch the majority of Laura’s comedy sitting next to your parents, and mostly still able to make eye contact afterwards. Ish Gupta is a Hartford area based comic who has been lucky to share stages with headliner comics such as Andrew Kennedy, Kevin McAffrey, and Katie Hannigan. He regularly performs at the Treehouse Comedy Club, The Elbow Room, and numerous other venues all over CT, MA, and RI. His comedy addresses a number of topics including weird jobs, his confusing hair, and silly things white people do. He hopes you are having a wonderful day! Stosh Mikita is a New Haven, CT based comedian whose comedy combines clever observations, self-deprecating humor, and dark personal stories from an unusual upbringing. Starting in 2013, Stosh has quickly become a regularly featured comedian all over New England. Rob Rego is an NYC based comic who writes for the satirical news site duffelblog.com. He is currently serving in the U.S. Armed Forces and does comedy all over the country. 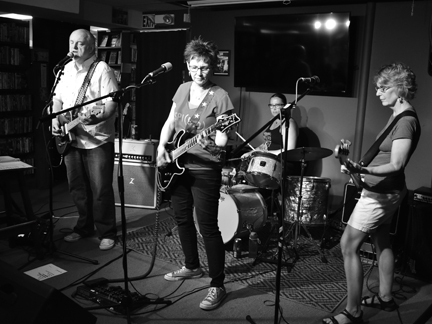 Jim Paradis plays Best Video Performance Space on Thursday, Apr. 25. The show starts at 8 PM and the cover is a sliding scale of $5-10 (pay what you can in that range). A modest sailboat on the New England coast is home for this singer-songwriter. Aboard with his guitars and recording studio, he marries music and melody to the lyrics he scribbles on napkins and journals throughout his travels. The songs Jim Paradis writes evoke a sense of home, love & loss and the changes life brings to a searching soul. 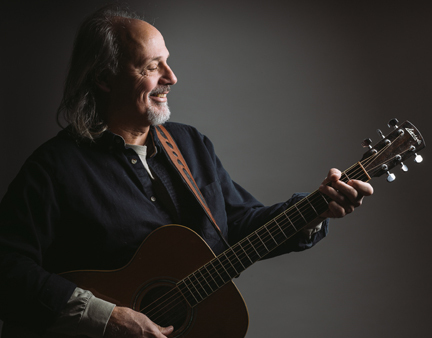 Jim’s smooth, melodic voice and finger-style guitar work are the perfect compliment for his intimate and philosophical lyrics. But it is his magnetic warmth that lifts him above the rest. 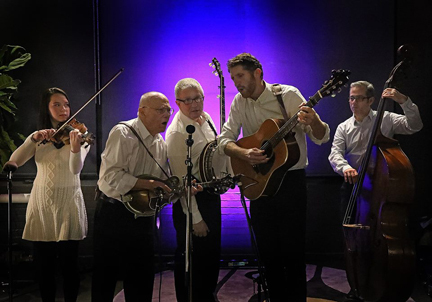 Jim draws people into the stories, into the energy, into the emotion of his heartfelt songs. 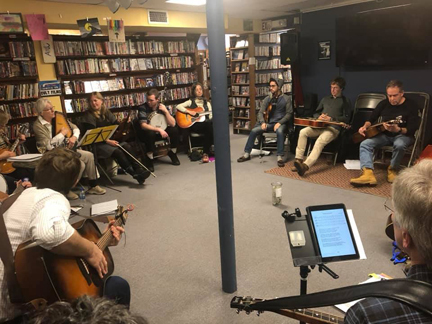 The monthly first Sunday GuitarTownCT bluegrass jams became so successful that Chris Wuerth added a new jam to the schedule. 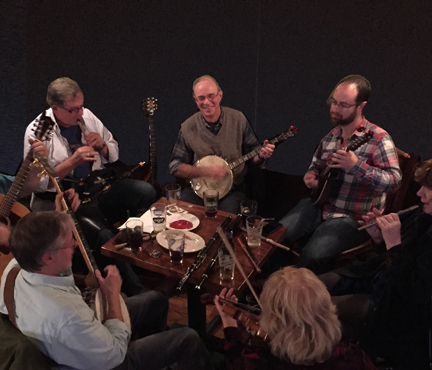 For those who need to twang community-wise more than once a month—or can’t make the Sunday afternoon events—we now have a bluegrass jam (usually) on the Third Monday of every month from 6-9 PM. Admission to this jam is a suggested donation of $5. Due to other scheduling, April’s jam is not on Monday but rather is on Tuesday, Apr. 23, from 6-9 PM.